If you are dealing with tooth pain, you likely want it to go away quickly! We always recommend coming in to see us if you are dealing with any type of tooth pain because it could mean you have a cavity or need other treatment. 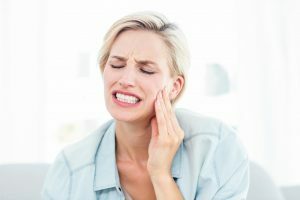 While typically the first thought that comes with tooth pain is that you have a cavity, the reality is there are a multitude of reasons you have pain in your tooth. Periodontal Disease- gum disease or gum infection can cause tooth pain. Nearly half of the U.S. adult population 30 or older has a mild, moderate or severe form of periodontal disease. Gum infections can occur when germs or bacteria enter the tooth or gum area and your body cannot fight it off. Signs of an infection include pain, swelling, a pimple above the tooth, pus or a bad taste in your mouth. Make an appointment as soon as possible with your dentist if you have any of these symptoms. Tooth trauma- an incident that happened either recently or even decades ago and caused trauma can cause tooth pain. This can be a fall, a car accident, or even chewing on food that traumatizes the tooth. This can cause infection or nerve damage inside the tooth and typically a root canal and crown are necessary. Cracked tooth- This can be caused by many things including trauma or tooth grinding. Tooth pain will be felt when biting down or drinking something hot or cold. Grinding– if you grind your teeth, it can lead to pain caused by a tooth fracture. If you have a misaligned jaw, this also can lead to teeth grinding with the imbalance causing tooth and muscle pain. Your dentist can help you with a night guard to help reduce pain. Recent dental work- if you have had a filling or other dental procedure done in the last few weeks, you may experience a temporary discomfort and sensitivity to cold. If you have sensitivity with your bite, you may need an adjustment made. Make an appointment for a follow up if you are noticing your bite seems off. This will help reduce and alleviate pain. There are many different causes for a toothache, if you are experiencing any signs including pain, sensitivity to hot or cold, pain when biting down, or other issues make an appointment with your dentist who can evaluate you and diagnose your source of tooth pain.